The Healthy Coffee That Loves You Back! Ahhh … the comforting aroma of a fresh brewed rich full-bodied cup of HEALTHY coffee! 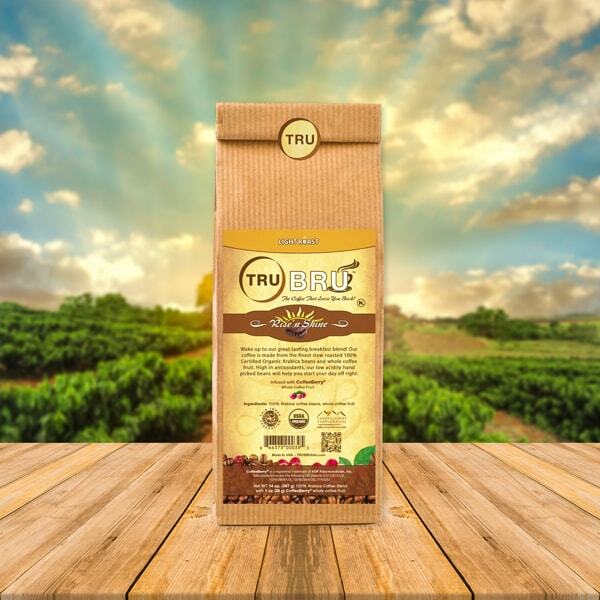 We are now proud to be able to introduce your taste buds to our TRUBRU coffee; a unique blend of our 100% Arabica beans infused with the amazing whole coffee cherry fruit! Our beans are hand picked, roasted to perfection, giving our coffee a subtle hint of the coffee fruit, making TRUBRU what we believe to be the healthiest coffee in the world! The full benefits of the whole coffee fruit went undiscovered for centuries. Not any longer! Through a painstaking process the coffee fruit can now retain its healthy goodness. 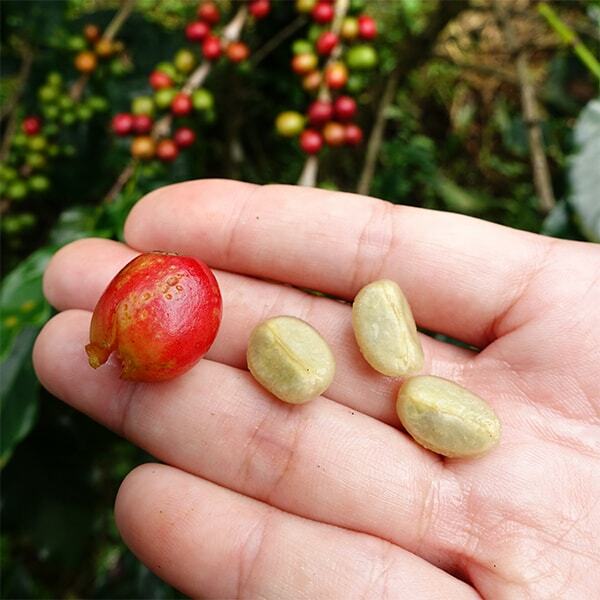 Due to our TRUBRU coffee having the powerful whole coffee fruit as part of our blend, we feel there are incredible benefits from having whole coffee fruit in our coffee. 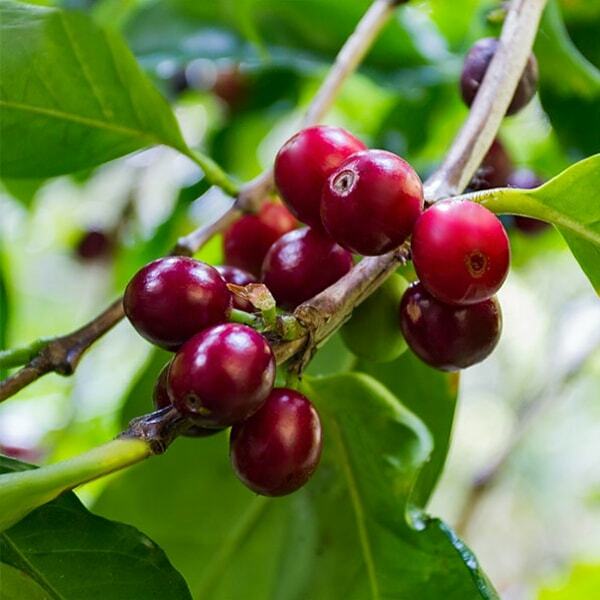 The whole coffee cherry fruit is also considered one of the top superfoods on the planet and rated very high in antioxidants and scoring an incredible 15,000 per gram on the ORAC scale. Studies have shown that antioxidants are substances that may protect cells in our body from free radical damage. This is something that can be beneficial in today’s highly toxic environment; which is why we use the whole coffee cherry fruit in our coffee. 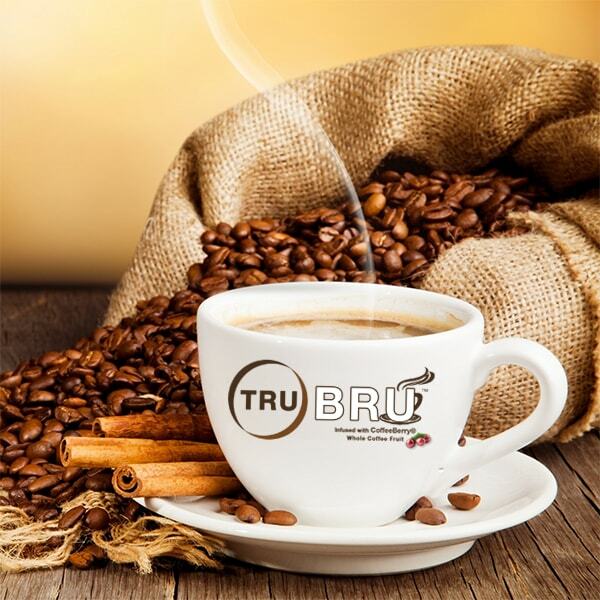 Knowing our TRUBRU coffee is infused with whole coffee fruit, takes our unique brew to a whole new level! 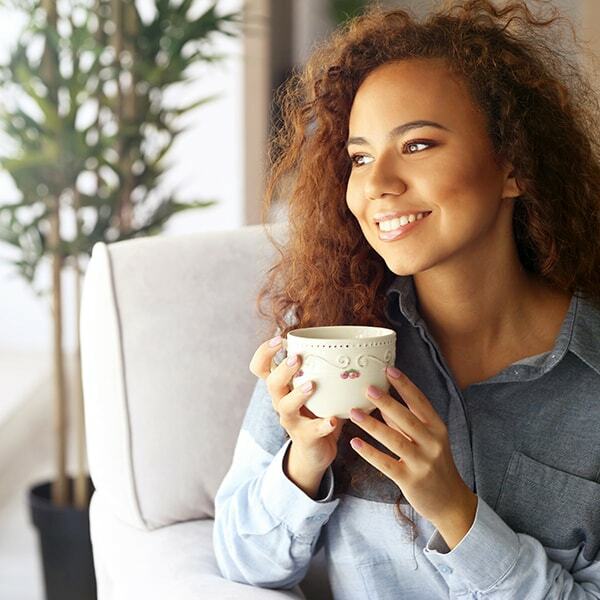 Just imagine … sitting back, with your eyes closed; savoring all that deep rich aroma and then tasting the full-bodied flavor of a delicious cup of healthy TRUBRU coffee. TRUBRU… our TRUly special blend of healthy coffee that loves you back … Enjoy! *CoffeeBerry® is a registered trademark of VDF Futureceuticals, Inc. 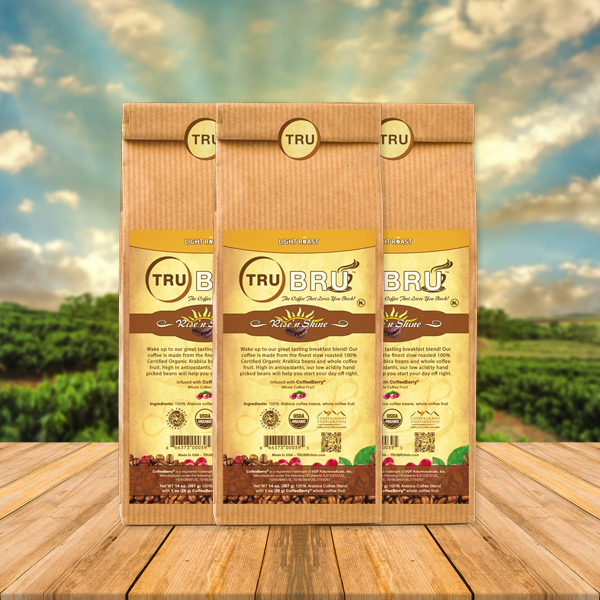 The Story Behind Our TRUBRU Healthy Coffee! TRU would like to take you on a romantic journey to an exotic and remote land that has held an amazing secret for thousands of years; an incredible love story that began between man and coffee. 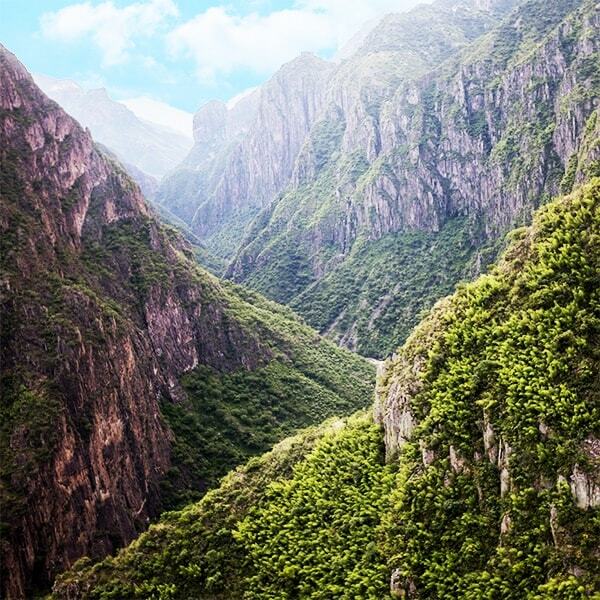 Our story begins high upon the slopes of volcanic mountainsides where a unique weather climate produces the perfect combination to infuse fertile soil with powerful nutrients, minerals and rich plant compounds. 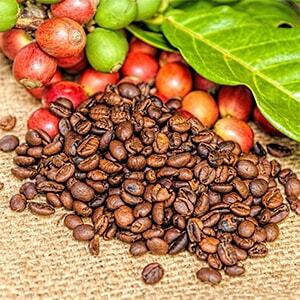 Nourished by nature and nurtured by man; both have worked together in harmony for centuries to cultivate an incredible plant that grows tall, healthy and in rich abundance; the coffee bush. 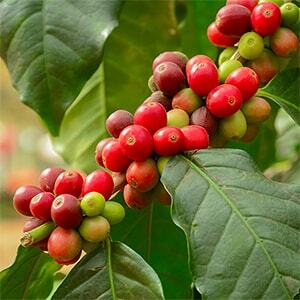 This lush green wild bush grows a mouthwatering bright red fruit that contains a highly prized seed that we have come to know and love as the ‘coffee bean’. For centuries this berry has grown and been tended with special loving care by experienced growers and then carefully hand picked at the perfect time. Once this seed or roasted coffee ‘bean’ was shared with the rest of the world and they tasted the rich aromatic brew; a love affair was born! Until recently however, the most important part of this wonderfully complex fruit, which surrounds the coffee bean, had been unknown and discarded for centuries. 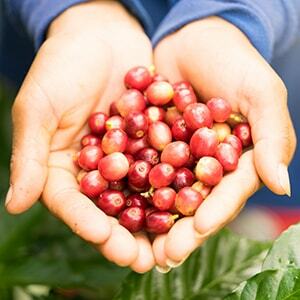 Those wanting to obtain the coffee beans began to notice the skin, health and longevity of those harvesting the coffee berries and set about to find out why. They noticed that the people were eating the berries as they picked, and once this realization set in it sparked a long and wonderful discovery process. Information that began to reveal an unknown secret; that the “whole” of this delicate healthful fruit was of great value and truly a gift of nature! A painstaking process of how to use this once discarded, yet most valuable part of the coffee cherry, was set in motion and perfected. This process helps to stabilize all the goodness of the whole coffee cherry fruit. Once we at TRU discovered the timeless story behind this incredible blessing of nature, whole coffee fruit, we had to find a way to share it with the world! We wanted to be able to offer not only a great tasting coffee, but a healthy one as well! 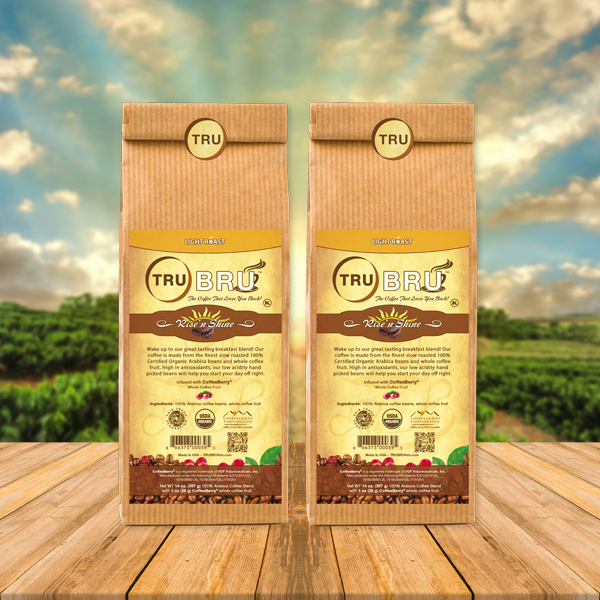 We are now proud to be able to introduce your taste buds to our TRUBRU coffee; a unique blend of 100% Arabica beans, infused with the whole coffee fruit! Our beans are hand picked and then roasted to perfection, bringing out all the rich full-bodied flavors we have grown to love from our coffee. 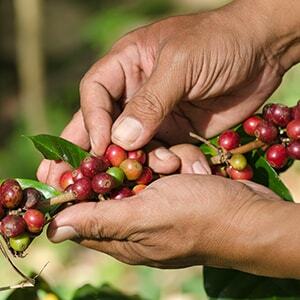 With a subtle hint of coffee fruit, this makes TRUBRU what we believe to be the healthiest coffee in the world! Go ahead and indulge yourself with a healthy cup of hot rich full-bodied coffee and share it with your friends. 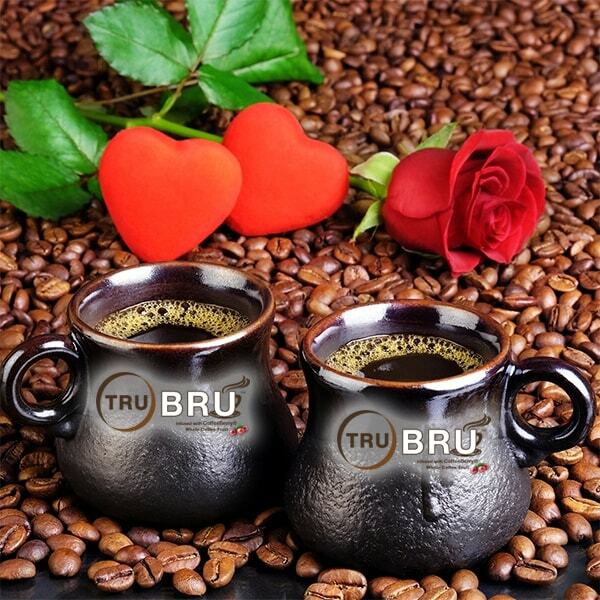 TRUBRU… The Healthy Coffee That Loves You Back! Who knew there was so much that goes into brewing a cup of coffee! There is a big difference between a ‘good’ cup of coffee and a TRULY GREAT cup of coffee! Mmmmmmm … I’m sure you agree that there is nothing quite like waking up to a full-bodied rich aroma of freshly brewing coffee is there. For most of us, drinking our first cup of the day can feel like we’ve been instantly transported to our own special place! The wonderful thing about having a great tasting coffee is that you can have it anytime of the day. Whether it is the very first one in the morning, a pick me up in the afternoon, or just a relaxing cup in the evening, anytime is TRUBRU time! So where do you start if you want to make the perfect cup of TRUBRU? Ahhhh … it is not quite as easy a question as it sounds; for each person has their own idea of what their taste buds say is that ‘perfect cup of a coffee’. Some say they like it weak, medium or strong; and yet everyone has their own personal idea of just what they feel makes their coffee weak, medium or strong. There are four basic things to think about when making that perfect cup of coffee … the right type of water, the correct measurement of grinds, the best type of filter to use, and how long it takes to brew the BRU! Yes, since a cup of coffee is mainly made up of water, the taste and aroma of your coffee will depend upon what TYPE of water you use. If at all possible try not to use chlorinated water as you will miss out greatly on that great slightly fruity tasting coffee you are looking for. If you do have to use tap water it is recommended to let it run for a bit (30 seconds to one minute) before you put it in your machine. Serious coffee connoisseurs seem to agree that spring water or having activated-charcoal/carbon filters installed on their taps is the best and NOT to use soft or distilled water as it makes terrible tasting coffee. Having minerals in your water are essential to help bring out the right balance and acidity in creating that perfectly clean tasting cup of coffee. There was one other thing I found out about the importance of water when making that, “Mmmmm … this tastes heavenly” or “Ahhhhh… nectar of the gods’ cup of coffee. You need to be careful of how HOT the water is when pouring it over your coffee. If you are using a coffee maker it is easy as all you need to do is pour COLD water into the machine and off you go. (For that ideal flavor it should only take around 5 minutes to brew a pot.) If you are using a French Press or Pour-Over Cone with hot water, then after it boils it seems the ‘rule’ is to wait around 30 seconds to one minute before pouring it gently over your coffee grinds. Not too fast or not to slow (20 to 30 seconds) is the best way to help extract the full flavor and you don’t burn the coffee. It is always recommended to keep your coffee makers cleaned regularly so that every cup of your TRUBRU will always taste at its finest! MEASURING the right amount of coffee for … YOU! As mentioned earlier, everyone has their idea of what they feel their perfect cup of coffee is. However, there is a general standard that everyone can start from. When it comes to measuring your coffee the common amount of coffee grinds is one to two level tablespoons (1-2) per 6 ounces of water or two or up to two-and-two-thirds (2-2/3) tablespoons per 8-ounce cup/mug. 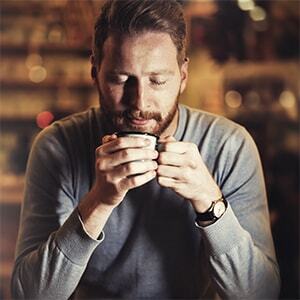 Some people try using less coffee and hotter water when making coffee but this can tend to more taste bitter; try experimenting until you get that ‘just right’ perfect cup of TRUBRU made just for you! There is some difference of opinion on whether white or brown coffee filters can enhance the taste of your coffee; however all are in agreement as to chemical free being much better for you and environment. When paper is first made it ‘natural’ color is brown and then through a chemical process it is bleached to give it that nice white color. A lot of white paper filters use a process of chlorine whitening that not only is bad for the environment, but creates dioxin and organochlorine residues, (of, relating to, or being a chlorinated hydrocarbon and especially one used as a pesticide (as aldrin, DDT, or dieldrin) something that studies have shown to be linked to have various health concerns. Some suggest rinsing coffee filter with water before using but that is totally up to you. So, by using as natural a filter product as possible, you can not only have a great tasting ‘cup of Joe’; but you will know it is better for you as well as feeling good about helping to contribute to a safer environment for everyone. Lastly, taking the TIME to get it right! Timing is everything they say, and coffee experts agree this is the case when when it comes to getting the most enjoyment from your coffee experience! Having a coffee maker that can brew your coffee in as little as five minutes, or pouring right temperature hot water over the grounds for around 30 seconds will help bring out all the subtle nuances in your coffee. TRU coffee gurus say serving a FRESH cup of coffee within the first 15 minutes after brewing is a must if you want to experience its optimum flavor. Now all you need to do is run to the cupboard, get your coffee out and start BRUing! 1 to 2 tablespoons of ground coffee for a 6 oz. cup/mug of water. 2 to 2 2/3 tablespoons of ground coffee for an 8 oz. cup/mug of water. A water temperature between 195 – 205 degrees Fahrenheit for optimal extraction. TRUBRU … The Healthy Coffee That Loves You Back!